One of the stand out quotes was that smartphones are now in an area of “invisible innovation”. That is, the connectivity (e.g. 5G), camera, processors and so on, are all improving, but consumers don’t see these. Consumers will soon see the feature improvements these invisible innovation upgrades bring. We’ll move from ugly QR codes to real image recognition, where our phones will recognise people’s faces, or objects we’re interested in. GPS will become accurate to a metre. And when that happens, there will be a cultural shift. We’ll speak to each other even less because our phones will tell us precisely where we are. Deloitte’s TMT predictions research shows how some cultural shifts have already occurred. We already prefer to use our smartphones for searching, reading news and watching short videos rather than a laptop or other device. The ASP (Average Selling Price) of a smartphone has almost doubled between 2014 and ‘17. This shows no signs of slowing down with the new Apple X. The highest growing demographic of smartphones sales are over 55 years old – they are still increasing sales at a staggering 19% per year. The move from advertising funded to subscriptions is well underway. Deloitte predicts that 50% of households will have an average of two subscriptions by the end of the year, and within five years it will have doubled to four per household. In my family, we have a Spotify family account, Netflix, BT Sport (free with our broadband) and the occasional Now TV or Google Video. That’s five straight away. Facebook and Microsoft are already purchasing transatlantic cables – just a couple of years ago the only companies buying such cables were telcos. Amazon and Netflix are investing huge amounts in content production – Amazon and Netflix are spending more between them that CBS, HBO, BBC, ITV and others combined. With traditional media consumption, in the US, UK and Canada, 18-24 year olds are watching between 5 and 15% less television each year. There are simply too many other distractions keeping their eyes diverted. But over 55 year olds are watching more TV than before – a staggering six hours per day. By comparison, under 35s were 3 hours a day and it simply declines as the age decreases. Live TV is experiencing higher revenues than ever before – hence the value in live sport. Trade show revenues are still increasing at 5% per year. Deloitte showed yy.com from China, where video stars are paid in virtual tokens (‘roses’, which they can convert to real money) for their videos. The revenues are outstanding, with half a billion dollars in cash and revenues growing each quarter. 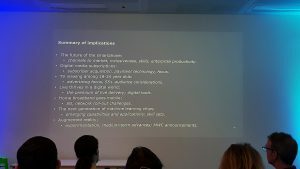 Deloitte’s TMT predictions indicate 2018 will see more games using AR and then other industries will follow from next year. Like Artificial Intelligence, the awareness of Augmented Reality is much higher than the usage. Facebook (and I suspect Google too) are only interested in the advertising revenue where Apple will see AR as a differentiator, and their approach with ARKit is different to their competitors. We’re starting to see some other interesting cultural changes with AR. One example was an AR art exhibition on Snapchat. Another challenge, presented by an AR company at the Deloitte event, is the usability – apparently it’s difficult to encourage users to physically move around an AR object. L’Oreal have already sponsored ‘lenses’ on Snapchat to enhance makeup. And we’ll see more selfies with famous people. We just won’t be able to work out if they are real or not (the celebrities). 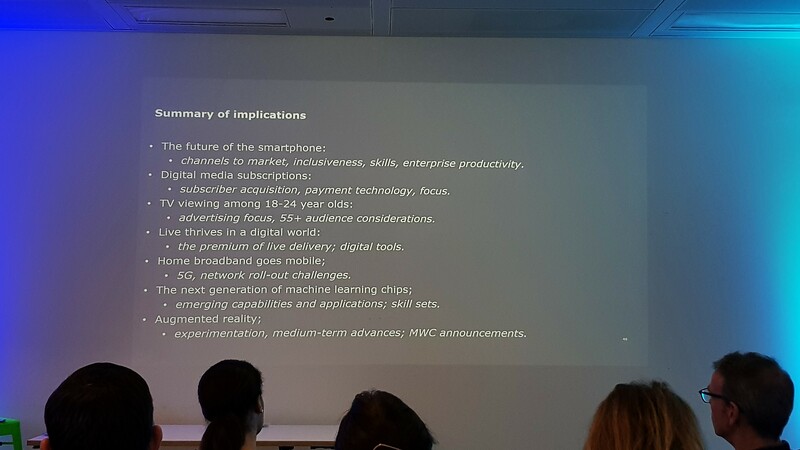 The full TMT predictions report can be found here on Deloitte’s website.